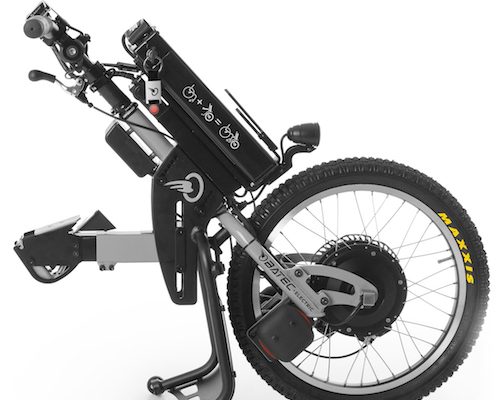 The Batec Quad Electric offers you a 2 in 1 approach to your needs: a unique solution that will revolutionise your mobility outdoors, without having to renounce to the advantages of your manual wheelchair. It is the definitive mobility tool for all those who have injuries affecting both upper and lower limbs ie., quadriplegia and related injuries. The Batec Quad Electric will allow you to gain time comfortably in short daily trips, while enjoying the new mobility it will provide. The G&B control, specially designed for all users with lesions in their upper extremities, will enable you to speed up and brake with smooth control movements. Whenever you like, you can disconnect the Batec in less time than it takes a person with no disabilities to get on or off a motorbike, thanks to the BATEC EASY-FIX anchor system. Even users with very severe disabilities can disconnect and connect the Batec autonomously.